I decided to paint an Australian robin for a change. It can be found in south eastern and south western Australia. Australia actually has quite a few difference species of robins. I will have to see if I can find some copyright free reference photos for the other robins. Scarlet Robin measures 4 x 6 inches and is painting on 300gsm smooth Arches watercolour paper. I saw a bag of walnuts while shopping the other day and thought they would make a very good still life prop so I ended up buying a bag. Would have been good if I could have just bought a few loose ones but they only seem to come in bags - fortunately they have a use by date to December. 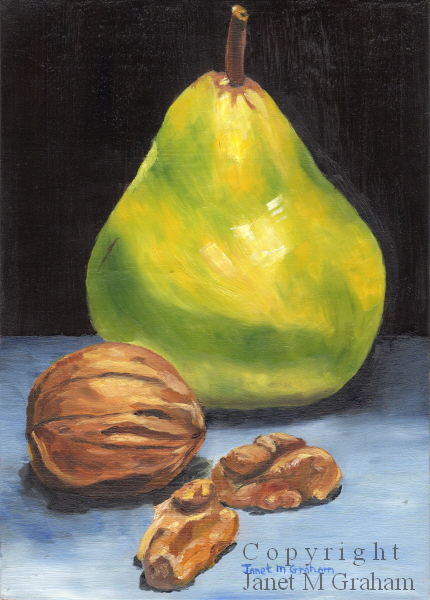 Pear and Walnuts measures 5 x 7 inches and is painted on Ampersand Gessobord panel. 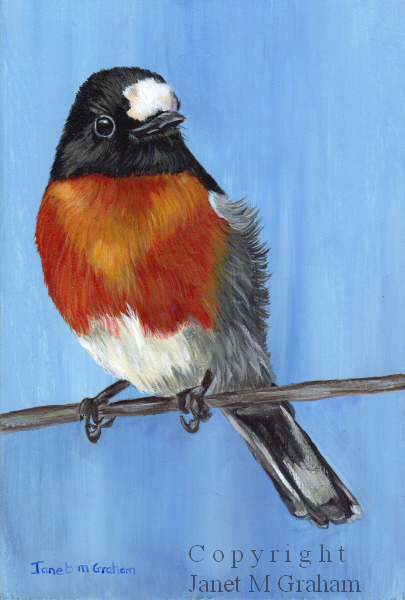 This little bird was fun to paint. An interesting fact about this cute little bird is that it hides food / seeds to eat later. They place the food in different hiding spots and can remember were they hid it. I find that quite amazing. 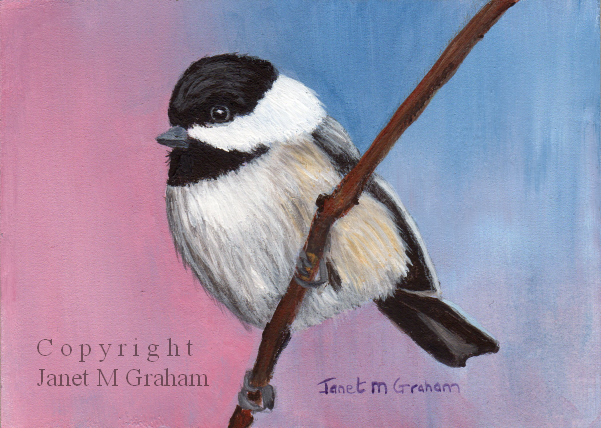 Black Capped Chickadee measures 3.5 x 2.5 inches and is painted on 300gms smooth Arches watercolour paper. 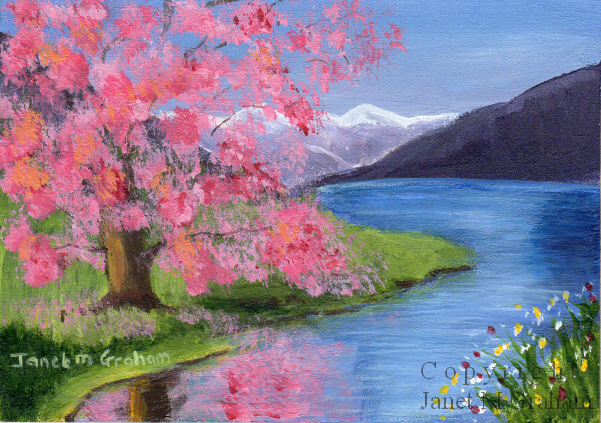 It is wet and cold here today so decided to paint a lovely little spring landscape scene to brighten up my day. I am very pleased how it turned out. Spring Blossoms measures 3.5 x 2.5 inches and is painting on 300gsm smooth Arches watercolour paper. I used about four different reference photos to create this scene. Started off with the raccoon and then thought about the scene I could create around him. It was fun seeing my initial pencil sketch take shape while painting. I am really pleased with the final painting. 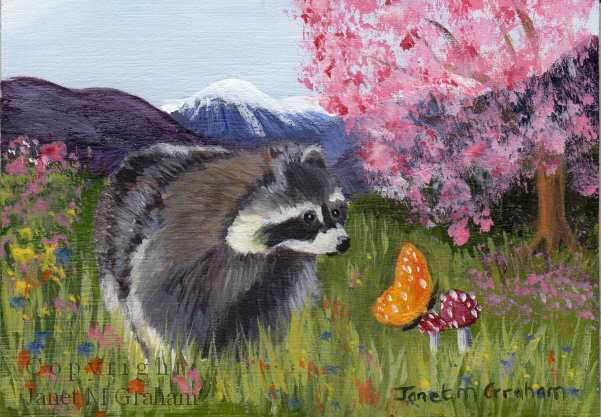 Raccoon measures 3.5 x 2.5 inches and is painted on 300gsm smooth Arches watercolour paper. 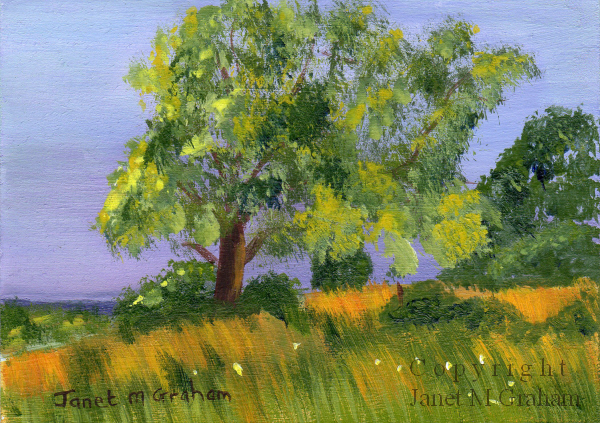 It is fun to paint little landscape paintings so decided to paint another one. This scene looks so peaceful - you can imagine yourself sitting by the stream listening to the gentle flow of the water. 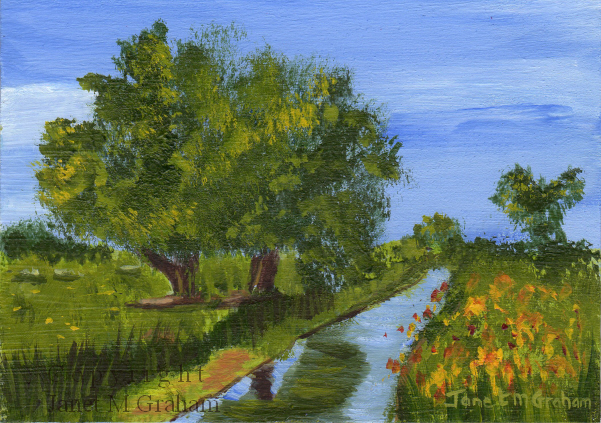 Country Stream measures 3.5 x 2.5 inches and is painted on 300gsm smooth watercolour paper. I have wanted to paint this scene for a while and finally decided to paint it as an aceo. Wasn't sure how I was going to paint the long grass and then I thought an old bristle brush should do the job. Worked really well. Hill Top measures 3.5 x 2.5 inches and is painted on 300gsm smooth Arches watercolour paper. 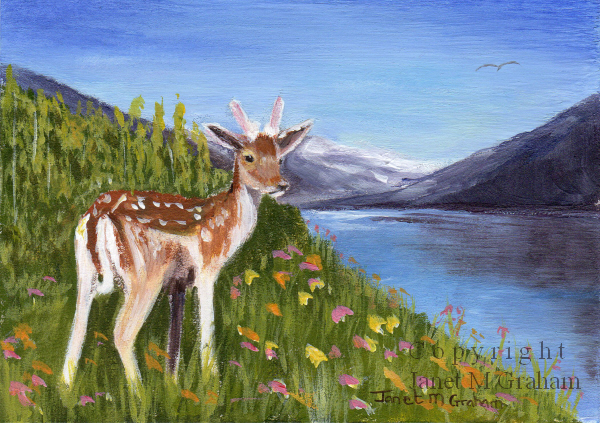 When I used part of this reference photo as inspiration for my Little Buck aceo, I thought to myself that it such a lovely scene that I had to paint it in full. So here it is. I decided to paint it in acrylics for a change. 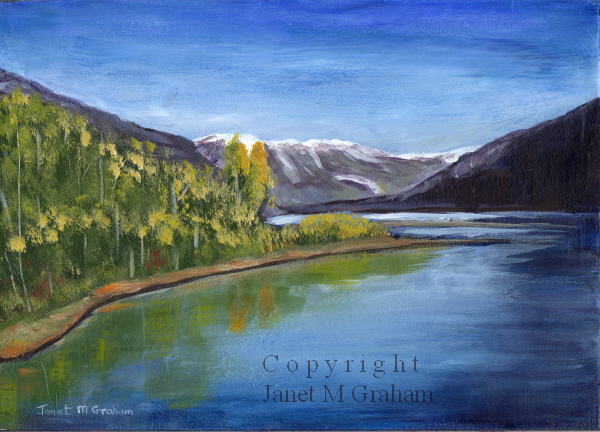 Lake with a View measures 7 x 5inches and is painted on Ampersand Gessobord. This one was fun to paint. It took a while to get the fur colour right but I got there in the end. I started off with a light green background and once I had painted the cat I darkened it so that the cat was pushed forward. I love the blue eyes of this cat. I will have to look for some more reference photos. 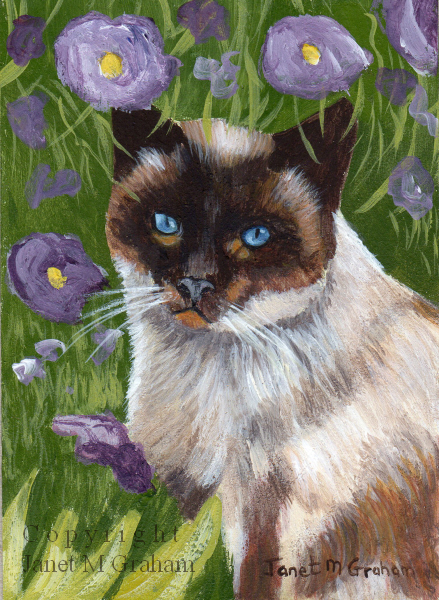 Siamese Cat measures 2.5 x 3.5 inches and is painted on 300gsm smooth watercolour paper. Many thanks to Elize Bezuidenhout for the reference photo. I love the colours of this one. I am very happy how it turned out. The painting actually took longer to dry than normal due to the rainy weather. The last few days have been nice and sunny which is a lovely change from all the rain. Fingers crossed it continues. 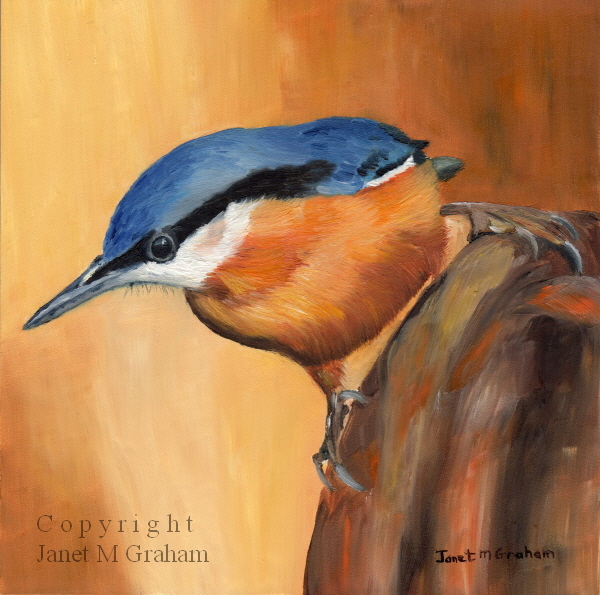 Nuthatch measures 6 x 6 inches and is painted on Ampersand Gessobord panel. I decided to paint something completely different today. It was rather tricky painting the stones but they turned out quite well in the end. We are having the strangest winter weather this year - we have had more rain than normal and last night of all things we had a storm!!. I have never experienced a storm in the middle of winter. On a brighter note the weather forecast for next week is sunshine - fingers crossed that they have the forecast right. 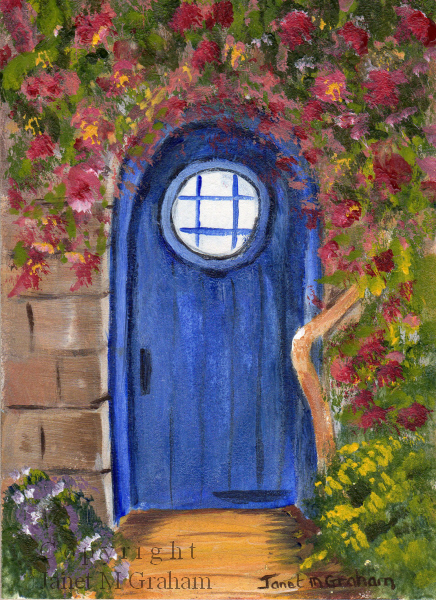 Blue Door measures 2.5 x 3.5 inches and is painted on 300gsm smooth Arches watercolour paper. I have wanted to paint this little fellow for a while but have been looking for the right landscape setting. I finally found it. I am really happy how it turned out. I actually enjoyed painting the mountains and water so I might do another painting based on the landscape reference photo. Little Buck measures 3.5 x 2.5 inches and is painting one 300gsm smooth Arches watercolour paper. Many thanks to Steve Lyddon for the buck reference photo and Terry Krysak for landscape reference photo. This bird was actually introduced to Australia in 1860's. Strangely enough it can be found in Brisbane but I haven't seen it here. I have seen it in Tasmania though. When visiting Woolmers Estate (http://www.woolmers.com.au/), there was one sitting on top of a rose bush. I managed to take a photo but the lighting was wrong and I was quite a distance from it so it does not make a good reference photo for me to use. 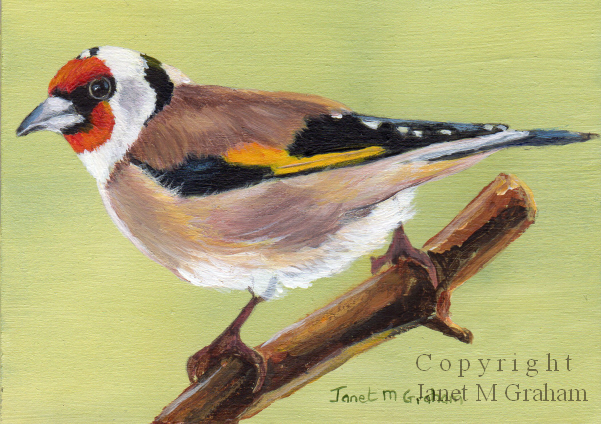 European Goldfinch measures 3.5 x 2.5 inches and is painted on 300gsm smooth Arches watercolour paper. 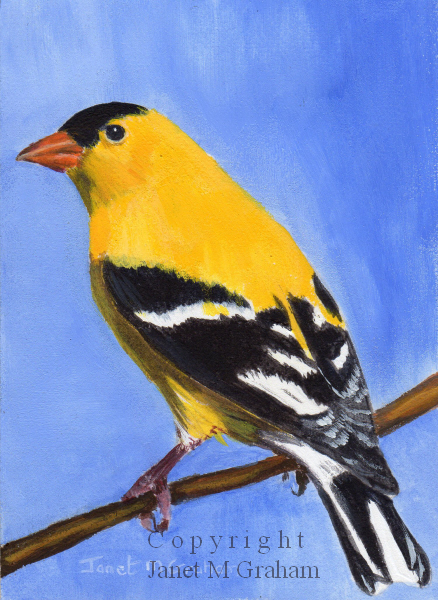 I loved painting this bird. Sometimes a painting just seems to come together from the beginning and this was one of them. I am very happy how it turned out. America does have some really beautiful birds and this is another one of them. It is found across Eastern North America. 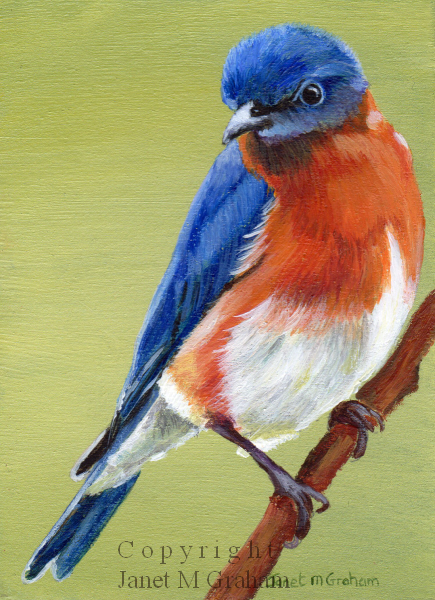 Eastern Bluebird measures 2.5 x 3.5 inches and is painted on 300gsm smooth watercolour paper. Many thanks to Marcus Moller for the reference photo. I love painting robins. I originally painted the robin with a light green background but I didn't like it so I ended up starting again. I much prefer the light blue background that I created. 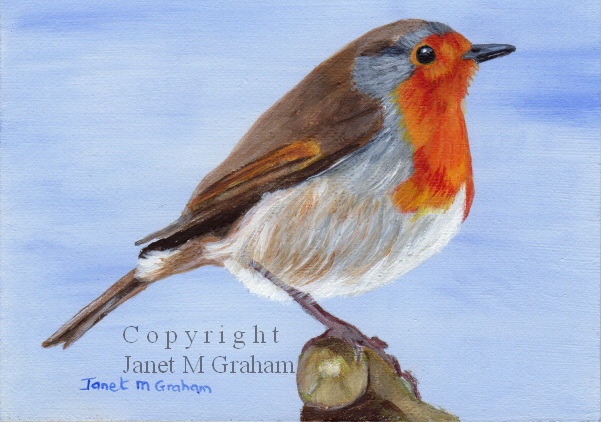 Robin 3 measures 3.5 x 2.5 inches and is painted on 300gsm smooth Arches watercolour paper. I couldn't resist painting this cute little fellow. 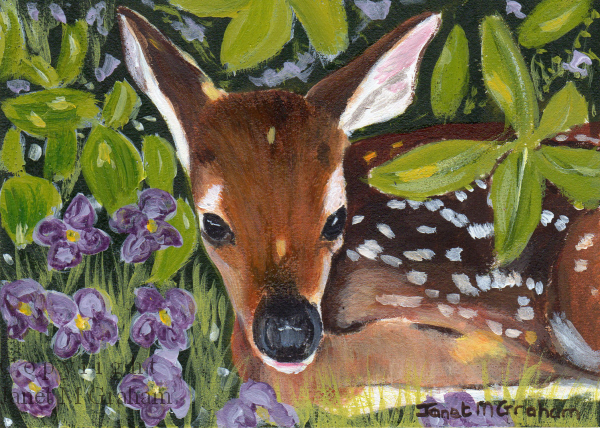 This time round I painted the background around the fawn as I didn't think I would be able to paint the fawn over the very dark green background that I started off with. Little Fawn measures 3.5 x 2.5 inches and is painted on 300gsm smooth watercolour paper. Many thanks to Jansam for the fawn reference photo. I really do love painting birds. I am really glad that I found a photo sharing site were generous photographers allow artists to use their photos as references. Otherwise I wouldn't be able to paint all these beautiful birds from around the world. Plus it is interesting reading up a bit about the bird I have painted. This bird mainly eats seeds and will only occasionally eat insects. Goldfinch measures 2.5 x 3.5 inches and is painting on 300gsm smooth watercolour paper.